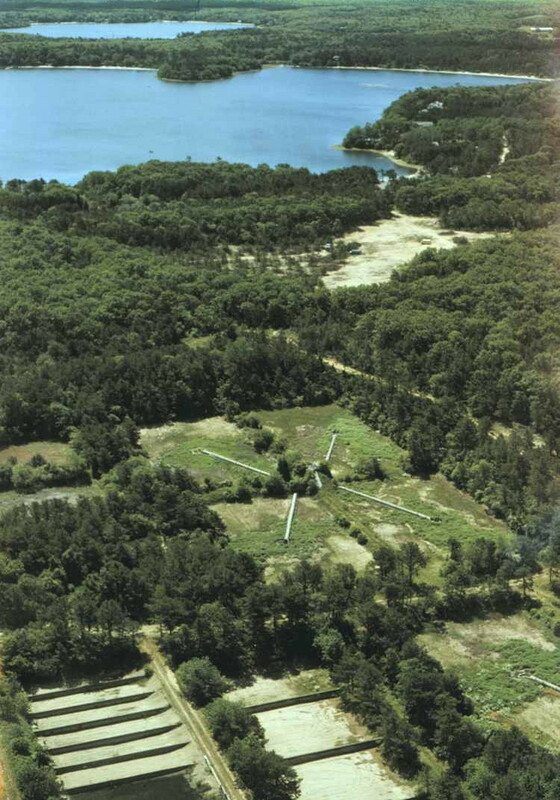 Treated wastewater disposal beds on Cape Cod, Massachusetts, which created a large subsurface plume of contaminated ground water. 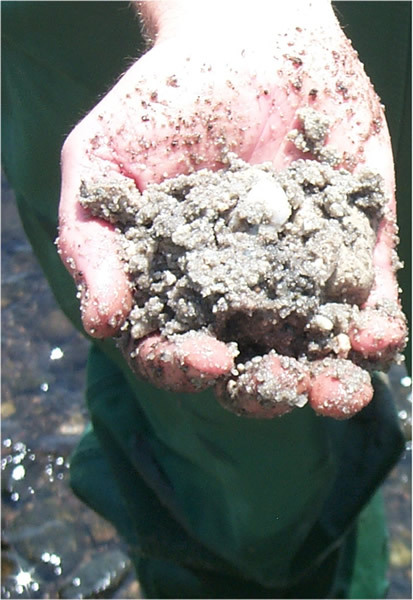 A handful of sand from aquifer sediments on western Cape Cod, MA. The surfaces of these quartz grains are covered by coatings containing iron and aluminum oxides and silicates. Arsenic in the coatings can be released by changes in chemical conditions. U.S. Geological Survey (USGS) scientists studying a subsurface plume of wastewater from a sewage treatment plant on Cape Cod, Massachusetts, observed arsenic at concentrations above the drinking water standard of 10 micrograms per liter (µg/L) even though wastewater from the treatment plant did not contain appreciable concentrations of arsenic. Further investigations showed the source of the arsenic to be from natural mineral coatings on the sediments of the sand and gravel aquifer that the wastewater plume was moving through. The wastewater plume changed the chemistry of the aquifer, creating conditions where arsenic bound to the sediments was released into the water. This was unexpected because sand and gravel aquifers normally have high-quality water, and are sought after across the country as drinking-water sources. The finding is significant because it demonstrates that naturally occurring arsenic, adsorbed onto the surfaces of quartz and other mineral grains, can be mobilized by human activities on the land surface with no link to arsenic. Land-use planners can use the results of this investigation to help identify and protect vulnerable underground drinking-water sources. 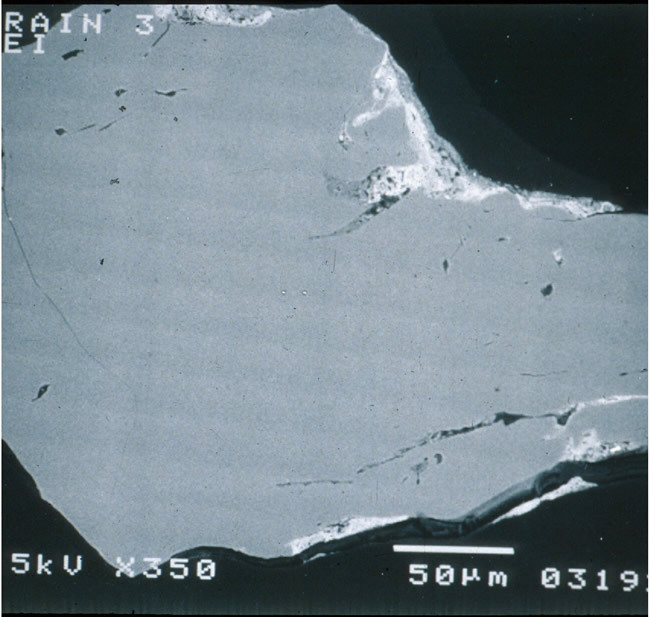 Electron photomicrograph of a cross section of a quartz grain from sediments on Cape Cod, MA, shows coatings (white material at the surface). The coatings contain arsenic that can be released under changing chemical conditions. Kent, D.B., and Fox, P.M., 2004, The influence of groundwater chemistry on arsenic concentrations and speciation in a quartz and sand and gravel aquifer: Geochemical Transactions, v. 5, no. 1, p. 1-12.